In this issue, - Mary McAleese reveals what people have most impressed her in her role as President of Ireland to date; - Minister of State Noel Ahern outlines what impresses him most about Community Development Projects and the volunteers and staff who run them; - And people in New Ross reveal why they think so much of their local CDP. There are also contributions from volunteers and staff in Ballybrack, Dublin, about why they do what they do. You can find out why Peadar Kirby tried to talk people in Costa Rica out of trying to emulate the ‘Celtic Tiger’ success. And our former diarist and current agony uncle, Horace, struggles with your many letters. However, the most important articles are based around a new report called ‘Rekindling The Fire’. When it was launched, the report made the RTE six-o’clock news. ‘Rekindling The Fire’ shows that CDPs triple the financial investment made in them by government by attracting further funding support for their communities. The report also highlights the real work that projects do to better their communities. The RTE crew broadcast from Ringsend, but it could have visited any of the 65 areas in and around Dublin with CDPs and seen the needs and witnessed solutions being put into action. CDP successes are incredible, and ‘Rekindling The Fire’ shows how Dublin projects are tackling the burning issues of our time. Editor: Allen Meagher Editorial team: Niamh Walsh, Gerry McKeever, Juan Carlos Azzopardi, Viv Sadd and Allen Meagher Design: PrintZone, Limerick. Printed by: Walsh Printing Services, Castleisland, Co. Kerry Cover Photo: The Wicker Man in the Liberties, Dublin. Two CDPs were involved in this event. THANKS TO . 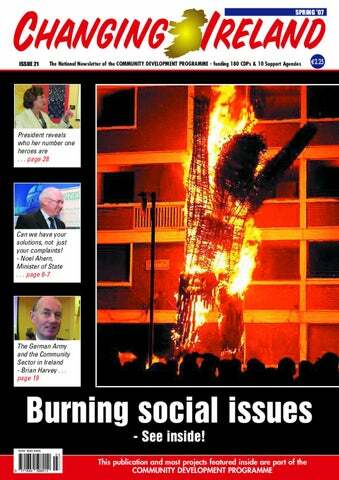 . . ‘Changing Ireland’ thanks everyone involved in the production of Issue 21. DISCLAIMER The views expressed in this newsletter are those of the author concerned. They do not, by any means, necessarily reflect the views of the Editor, the editorial team, the management committee of the Community Development Network, Moyross, Ltd., or the Department of Community, Rural and Gaeltacht Affairs. Ups and downs for Ross NEW Ross was known as an 'unemployment black-spot' during the 1980s and some shop-owners in the centre of the town remain shy to this day of painting their premises, as if lacking confidence in the future. Yet, property prices have shot up and so has the town's population. The town is a designated RAPID disadvantaged area. The River Barrow on which New Ross is built exerts both a positive and negative pull: Since the town sits on the edge of an electoral boundary, marked by the river that divides counties Wexford and Kilkenny, New Ross has gone many decades without a TD to truly represent it. On the other hand, the port of New Ross is always busy and thousands of people stop to visit the main tourist attraction, 'The Dunbrody' ship. NEW Ross CDP has adopted an open-door policy from the beginning, something that has helped the project greatly in reaching its target groups. family has been here for hundreds of years. It's a safe space where people from different backgrounds can sit down and have tea together. “We also look at identifying with the people what are the issues in this town, and see how we can improve the quality of life in New Ross,” added Conor. President McAleese pointed out that the phrase about cherishing-our-childrenequally “comes from the 1916 Proclamation, which is probably more important than the Constitution.” “A republic is a place where the children of the nation are cherished equally and you are the people who make it happen,” she continued. “What you do here in reaching out to individuals is more about the business of creating the Republic than anything else. I am very grateful to the people who create this space - this is a republic within a republic.” She said the CDP’s work was about overcoming the obstacles and gaps in society. “That's when a republic emerges and people believe in themselves and their country,” said the President. In the lead-up to the President’s visit, some people said to Conor that it was great the President was coming “to meet the ordinary people”, but Conor doesn’t see it that way. He said they aren’t ordinary, they’re extraordinary, especially those who volunteer. CDP chairperson, Joan Whelan showed President McAleese around the premises – formerly a squash court attached to a public house – and introduced her to people. "Most CDPs go for (organising) various groups of about eight people. We go for an open door policy,” said project co-ordinator, Conor Dervan. One of the coarsest measures of the CDP's success is the abuse that was directed at the project. During a recent local fundraising campaign for the CDP, some locals dismissed the fundraisers, saying: "That place is only for blacks and scumbags." "There are people in town who would be quite happy to see our lads back on the street drinking," noted Conor. The need for a drop-in centre in New Ross was identified as a top priority in the CDP’s first workplan and the search began for a suitable premises. The early years, therefore, saw the project move from Mary Street (not central) to South Street (up a tight stairs) to Barrack Street (perfect). Annette had an example in mind: "The health board have a huge budget for mental health and it's not good enough for them to say men or Travellers are not using the services and to leave it at that." She added: "It's also your own approach too - you have to welcome everyone you see coming through that door. I believe everyone deserves a chance. Just because someone did something five years ago… well, they might be a different person now." Minister of State, Noel Ahern, with Minister Éamo Gaeltacht Affairs. local solutions into the national plan. Government doesn’t have all the answers and that’s why we have local development groups who are in a better position to identify and put their finger on what is wrong, to influence it at a local level. I feel that’s the essence of a community development programme so that people can not just tell you what’s wrong but feed into the system and tell you how to put it right. Nick: Why do CDPs not have a representative on the Taskforce Committee on active citizenship? the new ndp presents opportunities for local communities that was not there before. I think the figure is something like 170 million but that’s just core funding for the CDPs. The real value of CDPs is not what they get for their own core funding but what they can get from other government departments and agencies for their communities. We’re talking about two things. What the CDPs get for their own funding and what they can leverage for their communities. The second figure is the important figure. Nick: When you look back over your involvement with CDPs what are the biggest achievements you and minister O’Cuiv have made over the last few years? What things remain to be done? Minister: The achievements of the Programme are more about what has been achieved on the ground. Last year, I was glad to be able to provide grant-funding of one-million euro for equipment and programme costs in the Once-Off Grants Scheme. The Traveller Work Placement Scheme was started in a small way and is now on a firmer footing, there were certainly more groups going for it this year. In relation to our own achievements, getting the programme into the new National Development Plan needed a lot of work. We got the programme through a slightly rocky time in 2002 and 2003 and the special niche that CDPs have has been recognised and has been built on and the fact that the Programme is in the new NDP is an indication of this. Nick: Finally Minister, you told ‘Changing Ireland’ around the time you started the job that you liked to go for a couple of pints after work. Are you still getting time? Minister: I won’t be having time for too many of them for the next couple of months. It is the fourth NDP. The first began in 1989. €183.7 billion is promised from now to 2013. For the first time, Social Inclusion gets a chapter. The budget for social inclusion is a staggering €49.6 billion. But, when you look more closely, all isn't what it seems. Unfortunately, the plan was not poverty-proofed. Nonetheless, it's looking good for community development. Yet, there is a weakness in the system for monitoring spending. Though Government will keep a close eye on spending. such as debates or speeches, during an election campaign where one or more of the candidates are present for public questions. In those areas where nothing is currently planned, EAPN is seeking to work with local groups "to roll out a series of nationwide hustings to ask what the various candidates or parties will do to eradicate poverty in the next Dáil." Wexford women seek to shape election issues By SARAH-BETH WATKINS KEY concerns for women in County Wexford ahead of the 2007 General Election are health issues, childcare, access to education and community policing. This was agreed upon at a meeting of CDPs, Family Resource Centres, local women’s groups and statutory agencies. The lack of women in politics, housing shortages and the lack of services for people with disabilities are also high on the agenda. Approximately 50 women participated at a recent event organised by the County Wexford Community Women’s Collective with a view to influencing the local elections. Key speakers discussed how to challenge the government and opposition party election candidates on key issues. Mary Rushimbi from Tanzania has been working for over 13 years to influence elections and increase women’s leadership. Mary Rushimbi from the Tanzanian Gender Network, spoke at the Wexford Women’s Collective. She is the Director of the Tanzanian Gender Networking Programme. Since 1996, its work has included: the democratisation of political processes, acting as an election watch-dog for gender sensitivity, producing election manifestos, and gaining media support to promote progressive public debate. Mary was visiting groups in Ireland by invitation from Banulacht, the organisation for feminist development education. Ailbhe Smyth, Director of Women’s Education, Research and Resource Centre, UCD, facilitated the workshops that identified the key issues affecting women in Wexford. The Collective are now organising a county-wide campaign to make politicians aware of the issues. A report of the day is available on request. For more information contact Angela or Sarah at Templeshannon CDP: Tel. 053-9237511. European Anti-Poverty Network (EAPN) Ireland and was the second such workshop to examine the issues in a community setting. The Community Workers Co-op has been to the fore in examining the small print in the plan. The CDP's premises at Northside Resource Centre, Forthill in Sligo town, was the venue for the two-anda-half-hour morning workshop. why do they lock petrol station toilets – out of fear someone will clean them? Alive, Alive-o! IN a letter to Horace (page 12) it is pointed out that there are seven areas in Dublin whose names end in the letter 'O'. For the record, they are: Rialto, Marino, Portobello, Phibsboro, Monto, Casino and Pimlico. will have regard for the National Development Plan 2007- 2013 and the NAPinclusion and will operate within ‘Reaching Out’ Guidelines on Consultation for Public Sector Bodies. The consultation is planned to run until June 30th of this year. It is expected that a variety of methods will be used to consult including meetings, reports and online submissions. Projects will be contacted soon by the Community Development Unit and advised on how to participate in the consultation. Organisers and winners of the poetry and art competition in Kiltimagh. Minister Éamon Ó Cuív is very eager to see a community centre open in Scariff. Dear Horace, There are four horses in my garden, I rang the Gardai about it but they said it was a matter for the local authority. But the council said it was nothing to do with them. What can I do? Sad El Horace replies, Don't be sad El, it's the same here. The only horses I like to see are horses from Templemore with Gardai on them. Once the local newspapers have taken their photo, they are gone. ‘Changing Ireland’: Can you change it a bit faster? i wondered why somebody didn’t do something for peace . . .
lady ambled across the room and, completely without ceremony, dropped the report into the lap of an extremely surprised and embarrassed Minister who, up to this point, had been proudly clutching a copy of the report he had been given at the door, and which he was now trying to stuff unobtrusively down the seat he was sitting on. The Minister took the podium and “recognised” (his word) two other politicians, Pat Rabbitt and Mary Upton, who had also managed to join us without being noticed. I suppose you have to expect this sort of thing if you’re going to lay on free food and drink within strolling distance of Leinster House. Somewhat predictably, the Minister assured us that his department knew what CDP stood for and then surprised most of us by saying he had never graced the golf and race courses Justine mentioned. He did, however, say that now he knew it was expected of him, he would soon. He touched on funding, he mentioned there were a lot of CDPs – even in his own area and he said they did all kinds of good work. To be honest he really only sounded comfortable with his subject when he started talking about the importance of the volunteer and of the guidance and support of the management committee and development workers. He sounded to my ears, then, like someone who knew how community development worked on the ground. When he said “ we are pleased to work with you though we don’t always agree with you,” I almost, just for a second, believed we were in a true partnership – the government and the CDPs. It just shows the dangers of rushing two glasses of wine. Now I want to return to Rita Fagan’s speech because it was the words of a worker on the ground that did more to motivate me and send me back revitalised to the project the next day to face the setbacks and disappointments which wait for us all each day than any words of praise from ministers and journalists. Rita said, “What we do throughout the country on a daily basis is reach out to those in our society who are on the margins, disadvantaged and excluded, often very vulnerable people. We build relationships with them, support them, work with them, involve them in groups. We build their skills and their ability to analyse the issues which affect them and their communities and we develop their voice to take up these issues. We come in all forms - networks, direct projects, communities of interest - but we all work from the same method, community development which is about social change.” I think that no matter how well meaning the politicians, the journalists, the government departments and the funders, the only people who can really give our Programme a voice is us. and remain familiar with local organisations and individuals. Continuous outreach is seen as essential across the whole range of working methods – allowing for the project to remain familiar with local issues and local groups; as well as for local organisations and people to become and remain familiar with what the CDP is doing. A number of projects specifically refer to the need to maintain ‘trust’ in their local working relationships. The report was drawn up following discussion between representatives of Eastern Region projects in the Community Development Programme. Brian Dillon of Nexus Research and Tony O’Grady of Partners CDP did the bulk of the writing. The group who worked on the report also included: Joe Grennell, Jennifer Flynn, Eve O’Connor, Sarah Kelleher, John Kiely and Sean Lambe. Allen Meagher of ‘Changing Ireland’ provided editorial advice. The Community and Voluntary section of the Department of Community, Rural and Gaeltacht Affairs financed the printing and launch of the report. The Eastern Region Network meets regularly and consists of CDP staff and volunteers. Geographically, the Eastern Region comprises Dublin City and the greater Dublin area including Fingal, Dun Laoghaire-Rathdown, parts of Kildare and Wicklow. There are 65 CDPs in the Region. become impossible to deliver; • a range of other local organisations and projects would cease to exist; • very important lessons on the causes and responses to disadvantage would be lost. The Community Development Programme, since its inception in 1989, has undergone significant change and has grown from 15 projects to 180 projects. Recommendations for 2007-2013 ‘REKINDLING The Fire’ argues that many community development projects need access to funding for extra staff. And since community development is a long-term process, the document recommends contracts based on 5-year plans. It argues for the establishment of a national office which would create a national profile that the Community Development Programme sadly lacks. ‘Rekindling The Fire’ strongly proposes the development of a relationship framework between the community sector and the Government which respects the values, approaches and practices of each side. In this context, it recommends: • copper-fasten the independence of the sector and its right to challenge government policy. • agree the development of a Code of Practice for funding the sector. • Government would commit itself to consulting the sector on issues likely to affect it. • a commitment to an annual appraisal of the relationship between Government and the community sector would be agreed in a ‘Compact’ between the community sector and Government. By far the most important factor – as identified by projects in their SPEAK returns – is CDPs’ capacity to become and remain familiar with local organisations and individuals. Continuous outreach is seen as essential across the whole range of working methods – allowing for the project to remain familiar with local issues and local groups; as well as for local organisations and people to become and remain familiar with what the CDP is doing. A number of projects specifically refer to the need to maintain ‘trust’ in their local working relationships. Projects hosted 3,500 meetings in one year PROJECT workers and volunteers are, for the most part, working directly with people who are frequently isolated and marginalised from even basic social interaction. So, project premises are being successfully used as a ‘safe’ and friendly environment which often act as a first point of contact for the most excluded. Even though projects spend less than 22% of their total time commitment in providing resources, advice and information, levels of activity are extremely high. For example, in a single year, among the 36 groups surveyed in Dublin: • There were 81,603 visits by individuals, and 5,698 visits by community groups to use the facilities of 36 projects in the Eastern Region. • Project premises and meeting spaces were used 3,501 times by local community groups for meetings. • Projects gave information or advice to 23,060 people, and referred approximately 8,655 of these on to other services or agencies. What’s the point in having an ‘equality year’? INTERVIEW WITH: N ‘E G REPORTER: What are the equality authority’s main priorities this year? “We see this as an opportunity, eight years into our own existence, to celebrate what’s been achieved, then, going forward, renew our commitment to tackling inequality. Through the proposed actions for the year ahead, we want to give a new dynamism to the equality agenda and leave a legacy for change into the future.” - Niall Crowley, CEO of the Equality Authority. ty Authority king for you! part of this “society of incentives”: can you comment on that? Inequality is a product of a range of different processes, it is created by society, and Irish society has chosen to try to address and eliminate inequality through legislation and other measures. (Niall was quoted previously – in the Irish Times – saying that equality is "not a soundbite issue"). What’s the foundation of equality as a value? Equality is something we make choices about. Globally, choices have been and are made, as can be seen in the rights-based conventions of the United Nations. Ireland’s equality legislation is also a choice. It is important to embed equality as a value, as it influences all the other values we have. That’s the mission of The Equality Authority. We do this on three fronts: 1. individual attitudes and behaviours, 2. institutional practices, and 3. cultural attitudes. The law (elsewhere) says to consult A recent study of the voluntary and community sector working with older people in Ireland shows that such organisations are rarely consulted by the state. In most European countries, they have to be by law. This is not to say that there is not a community development movement in Ireland. Clearly there is, it is effective in antipoverty work, committed and good people work therein and the language of antipoverty community development work has achieved a certain level of recognition and acceptance. But only a certain level. Veronica Bon, support agency worker, deep in discussion with Joan O’Flynn of Combat Poverty. The Community Development Programme is undoubtedly a good model and it has inspired the setting up now of a similar programme in Northern Ireland. (However), the programme, having expanded hugely and beyond anyone’s best hopes has been declared closed, as if community development can ever have finite boundaries. One of the hard lessons arising about the experience of community development and anti-poverty work is just how limited an impact community development can have when state economic and social policies do not also address and confront policy. government perversely looks to the model of the United States, a country which has achieved the worst social outcomes in health in the western hemisphere, although the highest profits. Community development marginalised In the face of these realities, community development can offer only marginal improvements (for) groups and communities living in deprivation. That does not mean that community development has not achieved something, it has, those humanitarian gains have been important and they hold out the promise of what more can be achieved. By contrast, if we look at successful European countries, community development and enlightened social policy have gone hand in hand. Eg Scandinavia. So, what hope is there that anti-poverty work here can emerge from its dark valley? an old one: what do you call a fly without wings? - a walk! rope in work Centre for Public Inquiry, but several members of the Oireachtas of different parties made it plain that there should be no role for such a non-governmental, civil society organisation in Ireland. Civil society is valued, abroad Contrast Irish intolerance with the European Union’s white paper on governance which not only affirmed the value of civil society but welcomed the role of non-governmental organisations as a channel for protest. We are still a long way from that here. In anti-poverty work, our failure to define a space for civil society has cost us and cost the poor. (Brian was dismissive of the new NDP, despite it having a chapter on social inclusion). Reclaim civil society here! The community development movement must move on to a new phase in its evolution, one in which it connects to the relevance of politics. Time to start ‘reclaiming civil society’. A first step, is to break this country’s and this government’s infatuation with American social policy. Europe, even with its faults, has so much to offer us - the best economic performance in the world, a diverse media, rich culture culture, how to manage diversity, equality, social policy, environmental protection, the best public services in the world, the most hopeful approach to sustainable development. So perhaps, with these approaches in mind, we can emerge from the dark valley and reach the sunlit uplands. Ann Galvin and Breda Ryan-Long of Cumann na Daoine CDP, Youghal, at the conference. community sector to government,” he said, highlighting the obvious. By contrast, he pointed out, there is one in the north – the Northern Ireland Council for Voluntary Action (NICVA). “NICVA is not just an assembly of civil society and voluntary organisations, but includes a formidable element of community development and anti-poverty groups and as an organisation has always made it plain that it believes in social change,” said Brian. He had earlier demonstrated that the Irish government’s much-ignored White Paper on the sector had taken 25 years to publish. “With such an equivalent organisation here, would it have taken our government a quarter of a century to design a policy for the voluntary and community sector?” He said that the voluntary and community sector in this state “hardly needs to handicap itself” by remaining disorganised, by continuing on without an equivalent to NICVA. Incidentally, Brian’s claim that there is “no national body to forcibly represent the voice of the voluntary and community sector” was accepted without protest by the large attendance. There were no cries in favour of the Community Platform, or the Community Workers Co-op, or even the Wheel. You got the sense he would have dismissed any protest easily. for greed and self-interest, in place of a robust society. We have recreated something akin to the aristocracy of British rule. For example, many big property owners live overseas, to avoid paying tax at all here,” he said. entitlements lags behind the rising prices of goods and services.” However, the failures are not inevitable. “They result from action or inaction by the state who usually bow to the needs of global capitalism rather than looking after the needs of our vulnerable citizens. That shift in power characterises the failure of the Celtic Tiger,” continued Peadar. * Peadar was speaking at the South and Mid-West Community Development Support Agency’s conference ‘Community development - a tool for anti poverty work in Ireland’. It was held in Tralee at the beginning of this year. Peadar is the head of the Centre for International Studies in Dublin City University. Peadar believes the past provides the blueprint for moving forward now: “One hundred years ago, our state had its birth in a remarkable social movement. We had the Irish language revival, a farmers' movement, the women's movement, sports revival, class movement under Connolly. At the same time, we had international protests here against the Boer War, which are a bit like the protests against Shannon being used in the US war now.” He believes a resurgence of a range of protest movements could move Ireland forward in a way that would benefit people more equitably. 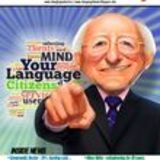 Check out Community Development courses in Ireland! and contact details for the courses will be placed on the Combat Poverty website in due course. New research is also being carried out to identify Community Development courses available at ‘Further Education’ level. Further Education in Ireland encompasses a very broad range of programmes from Post Leaving Certificate (PLC) courses to Adult Literacy classes to Apprenticeships. The study is on-going and researchers at Ralaheen will present their findings shortly. To contribute to the study or to find out more information, contact: Combat Poverty (Tel. 01-670 6746. E-mail: info@combatpoverty.ie. Website: www.cpa.ie) or Ralaheen Ltd (Tel. Helen O’Leary on 01-679-3400. E-mail: helen@ralaheen.ie). Introduction: Volunteering in Ballybrack THERE were 3182 people living in the Ballybrack CDP catchment area in 2006 and the population is declining. Between 2002 and last year, the population decreased by 251 people or -7.3%. This is unusual for any part of Dublin, however Ballybrack – despite houses there selling for up to €500,000. Ballybrack consists of nine housing estates containing 920 homes, but as a community, it generally misses out on basic services and people have to travel to other neighbourhoods to shop, see a doctor, engage in sports and so on. The CDP is now up and running and hoping to change things for the better, as chairperson Brenda Creigton fellow-volunter Tanya Breen, and project co-ordinator, Tina Pomphrett, explained to ‘Changing Ireland’. for a couple of years, but when the home-school liason teacher encouraged me, I did a personal development and assertiveness course. What paid work are you engaged in? Now I teach drug-education among primary school children. Some of that work is paid, some is voluntary. Name one problem here: The dual-carriageway cuts the community in half. It’s a community split by roads. What’s the most difficult thing about setting up a CDP? The amount of really good people that got fed up with the slow wheels of motion and dropped off the committee. Tina contacted them all (when the CDP was being launched) but they’d had enough. Are things getting better in Ballybrack? When I was aged 13, there wasn’t even a bus to Ballybrack. Now, we have a supermarket, church and primary school. And a CDP! ‘I don’t want this to fail’ Why volunteer? I was very nosy. I heard Brenda and another girl talking about it. I am the only person here who grew up their whole life in Ballybrack. Bar the summer projects, everything that came to Ballybrack went away again. Nothing ever lasted, it would always dwindle off. There are 920 houses here, but no local facilities. Is there anything for people to do in Ballybrack? Besides the youth services and the soccer club, that’s it here. What was it like when you were growing up? I was in Ballybrack Running Club years ago and we hounded the Council for a track . . . but we grew up while we were waiting for them to reply and the club folded. There’s a gravel track there now, alright. What about facilities in neighbouring districts? Cabinteely GAA is within walking distance. Are you glad you volunteered with the CDP? I didn’t know what I was leaving myself in for. Sometimes I go home and say ‘I’m not going to do this anymore’, but who else is going to do it? And also, I don’t want it to fail like everything else did here. And, finally, in ten years time, we might see some of the benefits from the CDP’s achievements. What would you hope to see? I’d love to see the community work together because it is very divided, road by road. I hope in ten years time that the CDP is well-established, well-supported. We could be the catalyst for bringing all the services, agencies and projects into the area. ‘Ballybrack is a pocket of disadvantage What makes Ballybrack different? The difference is that the services weren’t put into Ballybrack in the first place and unfortunately, it missed out on being listed as a RAPID area also, though we are working to change that. Are there other disadvantaged areas nearby? Loughlinstown, Ballyogan and Ballybrack are all pockets of disadvantage in county Dublin surrounded by affluent areas. Have you done much volunteer work yourself? I’m from (nearby) Ballyogan, a council housing-estate. I’ve worked voluntary there since 1996. Have you completed any training courses? I did the Maynooth Community and Youthwork Diploma part-time over three years (while also working a 35 hour week with Catholic Youth Care). What is the most recent piece of work you did locally? I supported a group of twelve local young people who attend after-schools activity. They designed a logo for our CDP. What motivates you? I’m at work here since March, ’06: Ballyogan CDP is very overdue, because the area is disadvantaged and has seen nothing put into it in 30 years. We hope to change that. What are your priorities right now? We urgently need a new premises and to involve new members. The temporary premises I met Tina in was cold and did not have a letterbox: here’s hoping a suitable premises turns up soon for Ballybrack CDP! ‘Hosting’ labelled as ‘a strength’ and ‘a weakness’ THE voluntary management and coordinator of Ballybrack CDP recently carried out a ‘SWOT’ (Strengths, Weaknesses, Opportunities and Threats) analysis and used the findings in developing aims and objectives for the Strategic Work Plan. It is worth noting that the hosting arrangement was listed as both ‘a strength’ and ‘a weakeness’. The voluntary management committee hope the CDP will become independent in time. - Don’t fear the media, use it! By ALLEN MEAGHER BOTH Moyross and Southill in Limerick city have been in the media a lot for, as the saying goes, all the wrong reasons. But that’s not quite true – much of the coverage has been steered, influenced and informed by community representatives. Community-approved solutions to problems here in Moyross were the ones being bandied about at higher level, at political and funding level. This is an achievement. The ‘talkers’ in the community were a mix of volunteers, people who were volunteers and are now development workers, anonymous residents, and adult relations of Millie and Gavin who are recovering from burns after an arson attack on the car they were sitting in. If ‘official’ Moyross had not engaged with the media, where would we be now? A lot worse off. As a result of the media work: - The media and politicians know it is a place that will stand up for itself in public. - Grants and other supports are more forthcoming than before. - Moyross voices have been heard nationwide, the people living here are heard to speak and are not spoken of as if they are mute and powerless. - Residents have learned how to use the media to get their message across. - There is still, against the odds, substantial pride among people from Moyross. Here’s what I know: A key part of community development work is to give voice to the needs and views of disadvantaged communities. Doing so through networking meetings is one half of the job. The remaining voice-work may be done through the media. Yes, it feels as risky as coal-mining, the roof could collapse on you at any moment. But I understand that many community groups have an overly-healthy respect for the media, with most CDPs avoiding the spotlight a lot of the time. Once bitten, twice shy. Well, as with mining, if adequate precautions and training are in place, the likelihood of anyone being hurt falls to nearzero. Already, some readers are probably saying to themselves that it’s best to continue as you are, saying nothing to or through the media. It is easy dismiss the media, saying “No-one reads that ‘paper” (or listens to “that station”) when you are dumped on in the press or on radio. Nonetheless, when communities do respond, the media will adjust their focus. Recently, a racist article was published in the ‘Limerick Leader’ and, following eight complaints, the editor reacted and the racistminded author no longer writes for the newspaper. Sometimes you owe it to the community you work with to engage with the media. Your community can use the media in ways you might not have imagined. Here are 12 tips to get you going: 1. The media is not a mad dog looking to savage you. Look at the media as a resource tool. 2. Find out how many of you in your project (paid and volunteers) and in your community are up for media work. Workers or residents who are shy of speaking on radio can be encouraged to work on press releases for the print media. 3. A day’s training would go a long way. Find out how to write a press release, and the do’s and don’ts of interviews. You wouldn’t pick up a kango-hammer without knowing how to use it, though a quick lesson and trial would go a long way. 4. The media can be easy to use. Call them up, tell them what you want to say and it’s said. Run a novel event and invite them along. Who do you know in your local radio station? 5. The media can be difficult to work with. They don’t see your story as a news story everytime. Remember, not everything will get published. 6. Engage with the media in a simple way. Facing a radio interview, list THREE POINTS you wish to make and no more. The first two might be facts you wish to highlight, the third being a solution you are proposing (and perhaps need support or resources to put in place). 7. You are undoubtedly highly motivated about your work and passionate to see your community prosper and to ensure your community comes out fighting anytime it is slandered in the media. 8. Go with your heart, with your conscience, in saying what you say. Don’t say any more than what you set out to say, unless it is to elaborate. 9. Do take care about the words you use to describe your community and groups within the community. Don’t be shy of being critical of ineffective government initiatives or lack of them. 10. Be honest. But you still don’t have to answer every question you are asked. Say what you are there to say to the listeners, no matter what you are asked. 11. Start off with a positive press release to the local media about an event you are running. Or phone Joe Duffy. 12. Run a media-training workshop or course in your community and publish a local newsletter. Pobail le Chéile CDP has moved website to www.pobaillc.com. The e-mail address pobaillc@eircom.net remains the same. The Galway Travellers Development Support Group CDP has renamed itself the Galway Travellers Movement CDP. June 4 International Day of Innocent Children Victims of Aggression 5 World Environment Day 17 World Day to Combat Desertification and Drought 20 World Refugee Day 23 United Nations Public Service Day 26 International Day Against Drug Abuse and Illicit Trafficking and International Day in Support of Victims of Torture The UN’s days, weeks, years and decades help focus the world on various issues of importance locally and globally. The UN calls on member states and other organisations to mark these days. Niall O’Brolcháin, Mayor of Galway, Hannagh McGinley, Galway Traveller Movement development worker, Margaret Ó Riada, GTM co-ordinator, Niall Crowley, director of The Equality Authority. as part of the national Traveller Focus Week by the Mayor of Galway, Councillor Niall Ó Brollcháin, and the keynote speech was given by Niall Crowley, chairman of the Equality Authority. Niall said it was disturbing but not surprising to read that 96% of the Travellers in Galway City have experienced racism. He suggested that Ireland is building a culture of compliance and that, despite the challenges of the Equality Authority (it can take 3-4 years to take a case) positive change depends on individuals coming forward to take a case and being supported to do so. Éamon Ó Cuív, Minister for Community Rural and Gaeltacht Affairs, commended the report and pledged that it will be discussed at a government level and will not be left to gather dust on a shelf. As part of the launch Michael Collins performed an extract from his one-man play “It’s a cultural thing! Or is it?” The Galway Traveller Movement CDP was established in 1994.
of people. Thirdly, Travellers must be placed firmly on the top of the agenda in Galway City and must remain a priority for all services. For more information, or copies of the report, contact: Margaret Ó Riada, coordinator of the Galway Traveller Movement CDP, tel. 091 765390. Few Travellers live to collect a pension* IRELAND would be near the bottom of the UN league in many categories of poverty if the Traveller community in Galway were surveyed by themselves and the UN believed these figures were typical of the broad Irish population. In a research project, the Galway Travellers Movement CDP have found that: • The unemployment rate among the Traveller community in Galway is 77%, compared to an overall population figure of 5%. • 49% of the Traveller population in Galway City is made up of children between the ages of 0-14 years, compared to 16% in the overall population. • 60% of the Traveller population in Galway finished school with no education or primary education only. At the report launch, Breda McDonagh of the Galway Traveller Movement CDP argued that education was "the key to achievement, power and freedom”. • Only 1% of the Traveller population is made up of people 65 years or over, compared to 8% in the overall population, strongly indicating that Travellers die at a younger age than their settled counterparts. Note: The Social Welfare Law Reform and Pensions Act 2006 has changed the name of the Old Age Pension to State Pension. The new name came into effect on 29 September, 2006. Racism Week (which incorporates the UN designated International Day Against Racial Discrimination on the 21st March). Members of Galway Traveller Movement CDP also took part in the city’s Saint Patrick’s Day Parade. The entry mixed aspects of Traveller culture such as recycling, nomadism and flower-making with a colourful magic machine. What did the Brits ever do for us? - the history we were never told WHAT did ‘the Brits’ ever do for us? According to Brian Harvey, community development began in Ireland on August 5th, 1891, to be precise, when the British government established the Congested Districts Board. The Board was “yet another in a long line of attempts to respond to the poverty” and it was very successful. He said what was even more interesting, from our point of view, was not just its aims, but its methods. The Congested Districts Board for Ireland, was staffed and led by some of the leading Victorian social reformers of its day, and used methods that would fit neatly in with any modern-day community development theory, for example: • The board started with a compilation of 84 baseline reports, describing in rich detail the economic and social conditions in each of the designated districts. • The board then set in train a broad set of measures for the economic and social improvement of the districts. districts. “Significant improvements were achieved as a result of its work,” said Brian. “So whatever about our understanding of the links between community development and anti-poverty work that we discuss today, that relationship was very well understood and practised by a state development agency at the tail end of the 19th century.” PS: One of the first things the new Irish government did in the 1920s was to abolish the Congested Districts Board – it didn’t suit their political interests and angered some of their wealthy supporters. How to move a buffalo, or a government THE mosquito style of protest is the best way to move a buffalo, or a government. So, how do you move a buffalo? He won't feel a big stick, he'll take no notice of you roaring at him. If one tiny mosquito bites him, he will not notice much. But if a cloud of mosquitos attack at the same time, he will become very uncomfortable and quickly retreat. "You should be imaginative in your forms of protest," suggested Peadar Kirby.